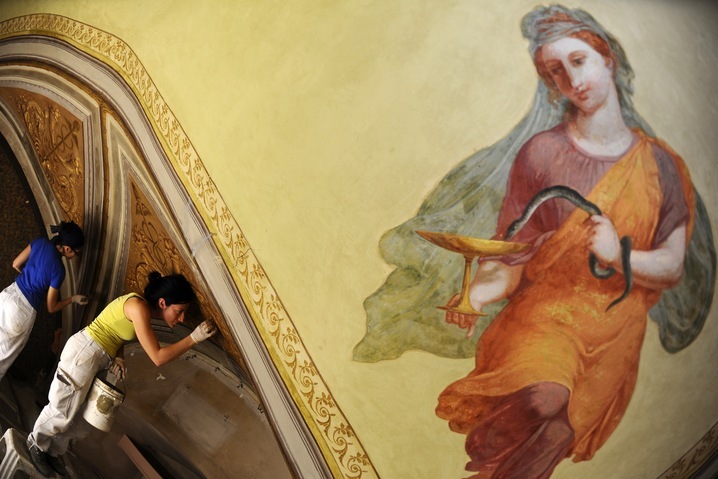 Restorers work on the painting of a ceiling of the Farmacia di Santa Maria Novella on Wednesday in Florence, Italy. The Pharmacy of Santa Maria Novella, founded in 1221 by Dominican monks, continues to sell traditional elixirs, oils and natural herbs, with clients such as Catherine de Medici in the 16th century to shoppers today. Photo by Gabriel Bouys/AFP/Getty Images.